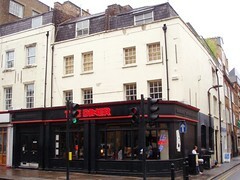 This is a fairly 'authentic' American diner on Curtain Road in Shoreditch. It also has branches in other areas of London including one in Soho and one in Shoreditch. The fact that every booth (and they are all booths) had French's mustard made Bec very happy. The diner serves breakfast until 4pm and offers a variety of egg dishes, pancakes and a 'Mexican' breakfast. On Bec and Sean's visit, Sean had a bacon cheeseburger with a side of guacamole for £6.40 (the guacamole was 50p extra) and cheese fries - the cheese was shredded and melted into a big, fatty glump which made all the fries stick together. This is Proper and a Good Thing. Bec had a spicy beanburger for £5.50 - which, unlike many 'spicy' beanburgers was actually spicy - and served with a giant slice of tomato and rocket. Onion rings were super fat and very crispy and cost £3. Bec also had a pistachio milkshake for £4 which was utterly gorgeous and a very generous amount. Mushroom-fearing vegetarians be warned: the only other veggie options are a taco or burrito, the filling of which is pre-mixed and contains the dreaded fungi. Note the prices on the website (as of March 2008) are slightly cheaper than what we paid. Last visited by Bec and Sean, March 2008. Prices verified on that visit. Last edited 2015-06-28 10:53:53 (version 12; diff). List all versions. Page last edited 2015-06-28 10:53:53 (version 12).